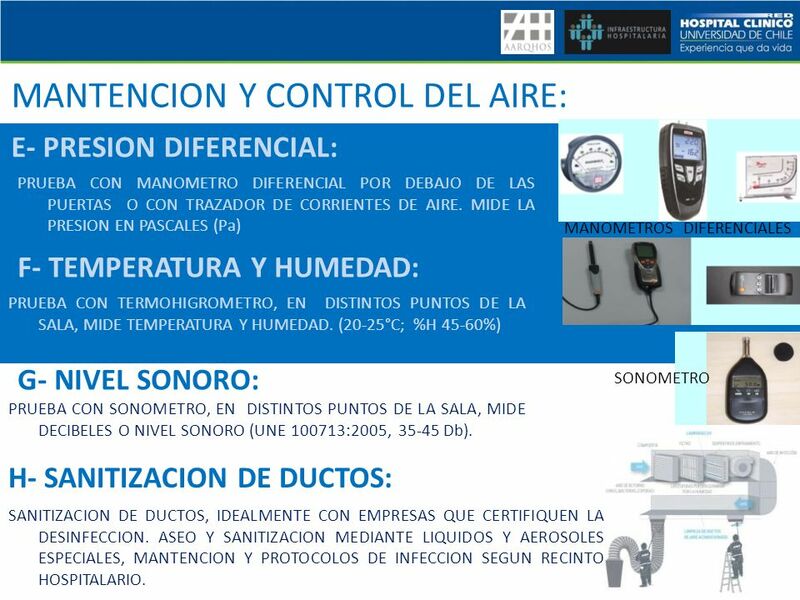 3 SALAS LIMPIAS Y CONTROL DEL AIRE EN RECINTOS HOSPITALARIOS. SISTEMA DE EXPANSIÓN DIRECTA: EQUIPOS DE VENTANA EQUIPOS TERMINAL CASETTE EQUIPOS SPLIT EQUIPOS MULTISPLIT EQUIPO PISO-CIELO EQ. 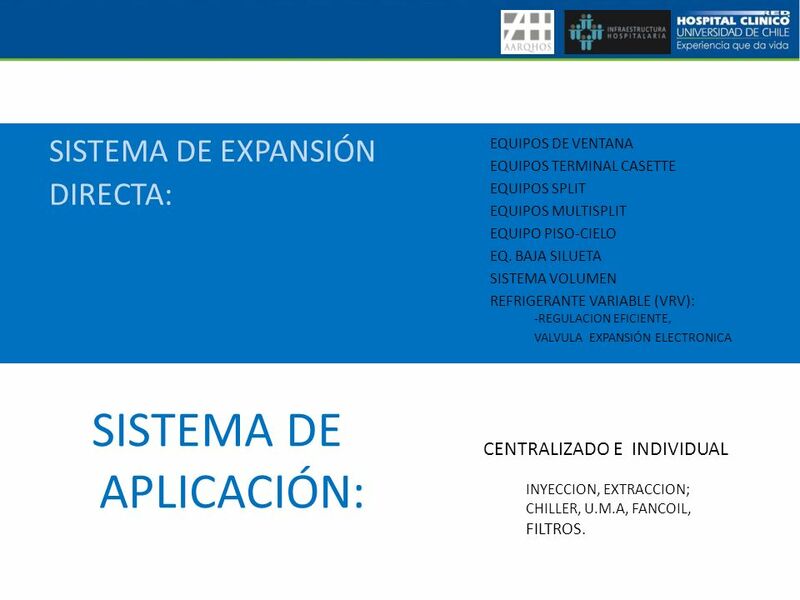 BAJA SILUETA SISTEMA VOLUMEN REFRIGERANTE VARIABLE (VRV): -REGULACION EFICIENTE, VALVULA EXPANSIÓN ELECTRONICA SISTEMA DE APLICACIÓN: CENTRALIZADO E INDIVIDUAL INYECCION, EXTRACCION; CHILLER, U.M.A, FANCOIL, FILTROS. -AIRE INYECTADO A DISTINTOS RECINTOS A MISMA Tº Y Hº, 1 SOLO TERMOSTATO. -SE USA PARA AREAS GENERALES COMO: ESPERAS, ADMINISTRATIVO, ETC. 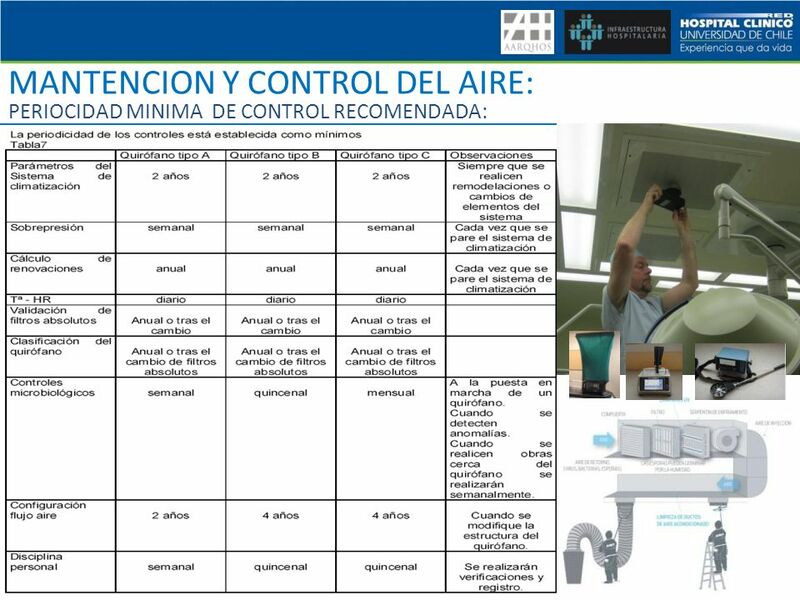 INDIVIDUAL: PARA SALAS LIMPIAS Y RECINTOS CON CONTROL Y MANEJO DE AIRE SE RECOMIENDA UNA APLICACIÓN INDIVIDUAL PARA SALAS COMO: QUIROFANOS, LABORATORIOS, INMUNODEPRIMIDOS, Y PARTOS, CRITICOS UCI, UCIC. LA APLICACIÓN INDIVIDUAL DE EQUIPOS EN SALAS LIMPIAS PERMITE: -FUNCIONAR INDEPENDIENTE CUANDO OTROS EQUIPOS TENGAN FALLAS O REQUIERAN MANTENCION. 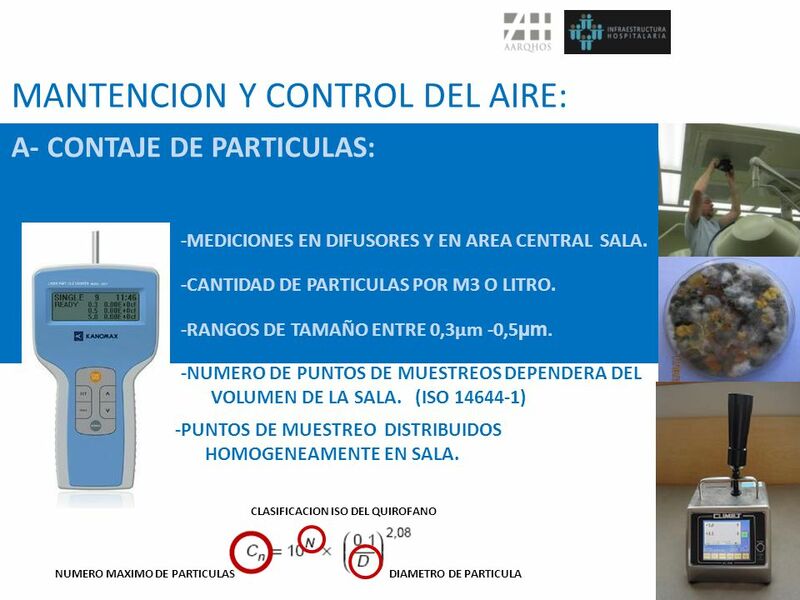 -NO EXISTE CONTAMINACION DE DUCTOS POR OTROS RECINTOS CON MENOR MANTENCION O INFECCION. -SE REDUCE EL GASTO DE ENERGIA Y COSTOS, REGULANDO INDEPENDIENTEMENTE CAUDALES Y FLUJOS CUANDO SALA ESTA EN DES-USO. 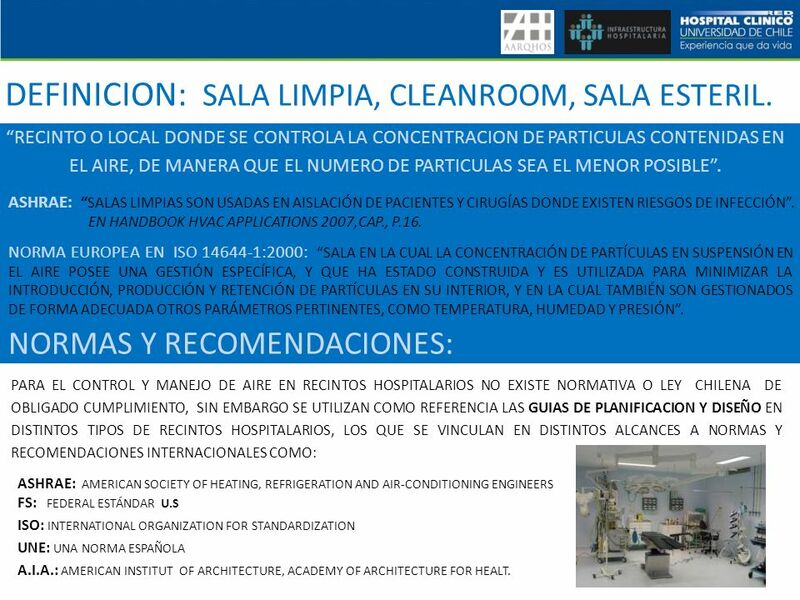 7 DEFINICION: SALA LIMPIA, CLEANROOM, SALA ESTERIL. “RECINTO O LOCAL DONDE SE CONTROLA LA CONCENTRACION DE PARTICULAS CONTENIDAS EN EL AIRE, DE MANERA QUE EL NUMERO DE PARTICULAS SEA EL MENOR POSIBLE”. 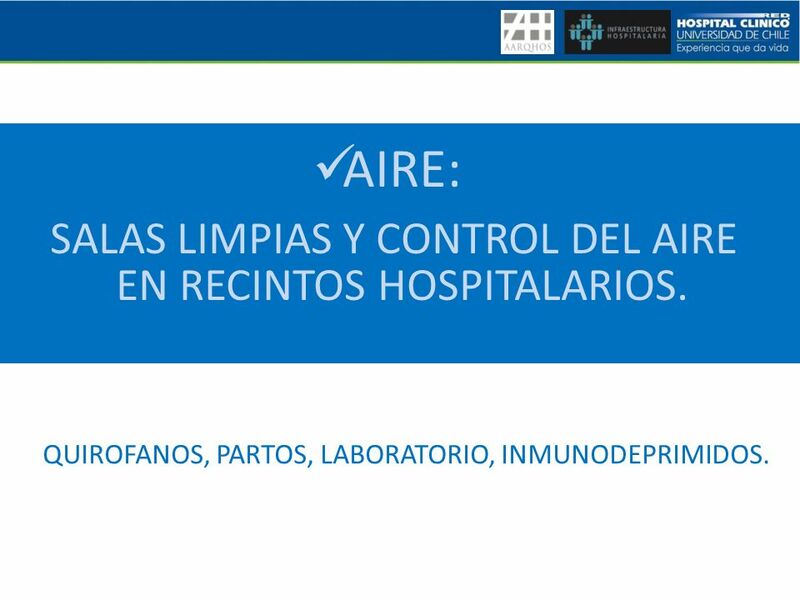 ASHRAE: “SALAS LIMPIAS SON USADAS EN AISLACIÓN DE PACIENTES Y CIRUGÍAS DONDE EXISTEN RIESGOS DE INFECCIÓN”. EN HANDBOOK HVAC APPLICATIONS 2007,CAP., P.16. NORMA EUROPEA EN ISO :2000: “SALA EN LA CUAL LA CONCENTRACIÓN DE PARTÍCULAS EN SUSPENSIÓN EN EL AIRE POSEE UNA GESTIÓN ESPECÍFICA, Y QUE HA ESTADO CONSTRUIDA Y ES UTILIZADA PARA MINIMIZAR LA INTRODUCCIÓN, PRODUCCIÓN Y RETENCIÓN DE PARTÍCULAS EN SU INTERIOR, Y EN LA CUAL TAMBIÉN SON GESTIONADOS DE FORMA ADECUADA OTROS PARÁMETROS PERTINENTES, COMO TEMPERATURA, HUMEDAD Y PRESIÓN”. 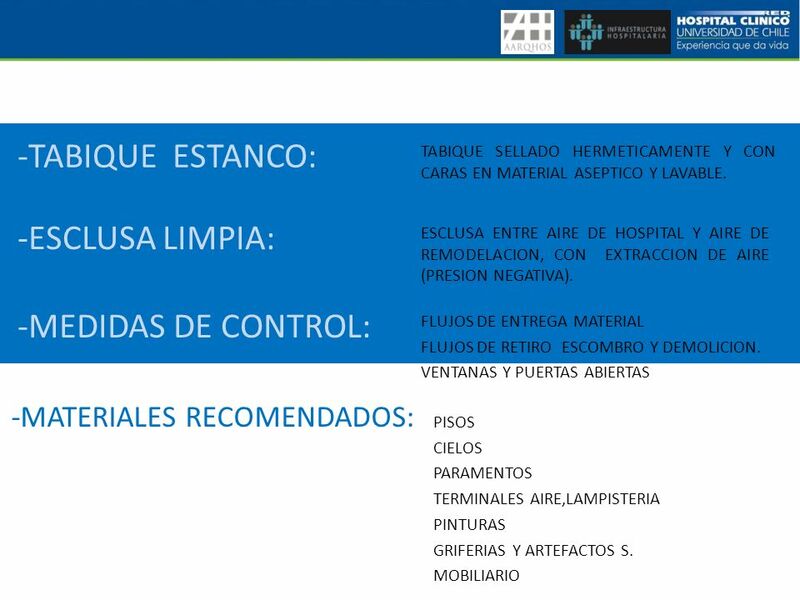 NORMAS Y RECOMENDACIONES: PARA EL CONTROL Y MANEJO DE AIRE EN RECINTOS HOSPITALARIOS NO EXISTE NORMATIVA O LEY CHILENA DE OBLIGADO CUMPLIMIENTO, SIN EMBARGO SE UTILIZAN COMO REFERENCIA LAS GUIAS DE PLANIFICACION Y DISEÑO EN DISTINTOS TIPOS DE RECINTOS HOSPITALARIOS, LOS QUE SE VINCULAN EN DISTINTOS ALCANCES A NORMAS Y RECOMENDACIONES INTERNACIONALES COMO: ASHRAE: AMERICAN SOCIETY OF HEATING, REFRIGERATION AND AIR-CONDITIONING ENGINEERS FS: FEDERAL ESTÁNDAR U.S ISO: INTERNATIONAL ORGANIZATION FOR STANDARDIZATION UNE: UNA NORMA ESPAÑOLA A.I.A. 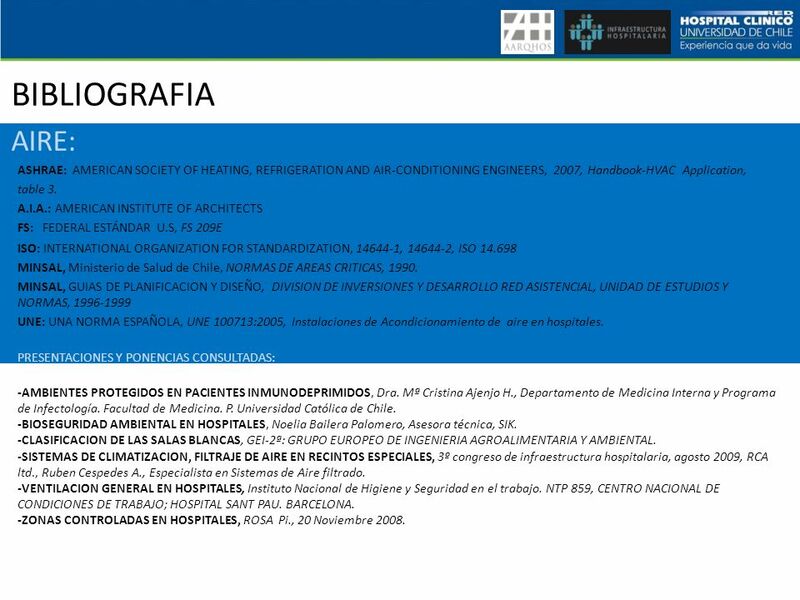 : AMERICAN INSTITUT OF ARCHITECTURE, ACADEMY OF ARCHITECTURE FOR HEALT. 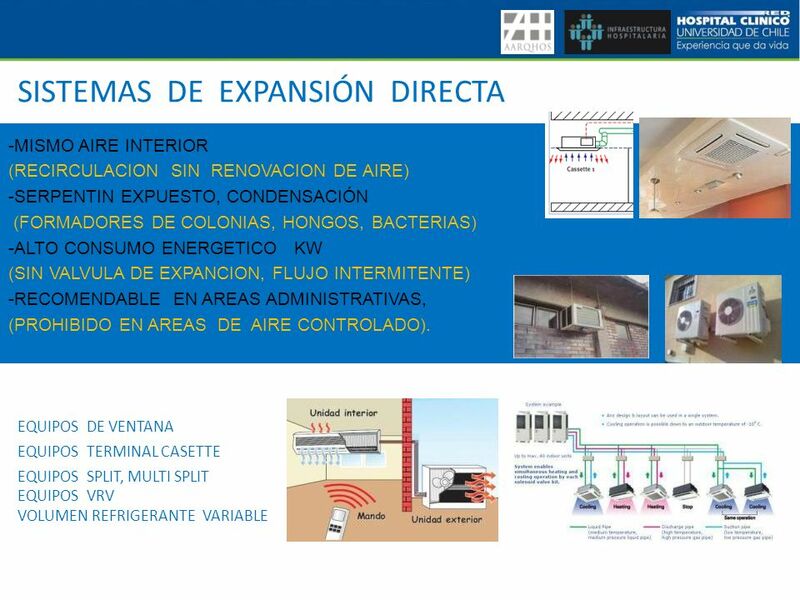 -CONTACTO CON EXTERIOR (VENTANAS, AIRE, SOL) NUMERO REDUCIDO DE INTERVENCIONES AHORA: MENOS ALTURA EN SALAS (3-4M) -HERMETICIDAD Y ESTANQUEDAD -OPTIMIZACION SALA, NUMERO ELEVADO DE INTERVENCIONES. TIPO A QUIRÓFANOS DE ALTA TECNOLOGIA. TIPO B QUIROFANOS CONVENCIONALES, DE URGENCIA. TIPO C QUIROFANOS AMBULATORIOS TIPO D UCI, QUEMADOS, REANIMACION, INFECCIOSOS. 13 LIMITE DE PARTICULAS EN QUIROFANOS. CLASE 1000 QUIRÓFANOS DE ALTA TECNOLOGIA, TIPO A. 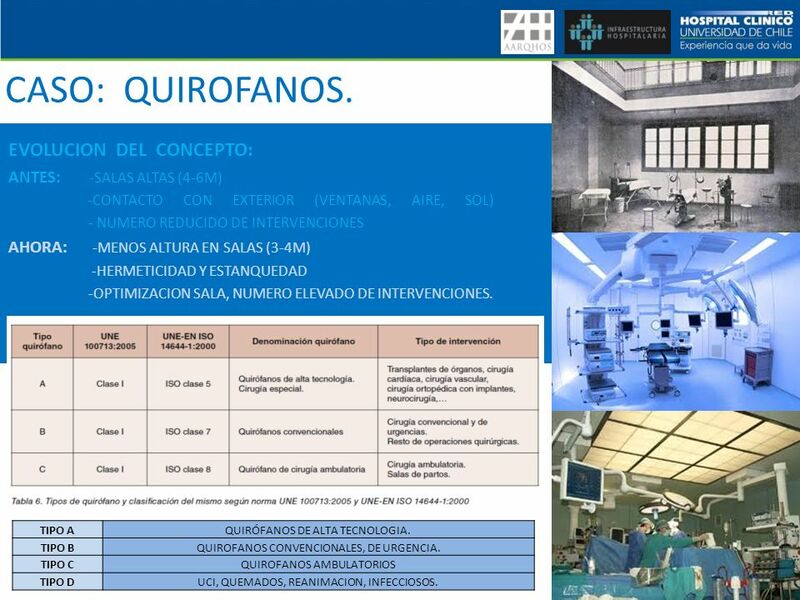 ( PARTICULAS DE 0,3 MICRAS EN UN METRO CUBICO) CLASE QUIROFANOS CONVENCIONALES, DE URGENCIA., TIPO B Y C. CLASE QUIROFANOS AMBULATORIOS, PRE Y POST OPERATORIOS. TIPO D UCI, QUEMADOS, REANIMACION, INFECCIOSOS. 14 FILTROS: PREFILTRO, BOLSA, H.E.P.A. A-CONTAJE DE PARTICULAS B-MUESTREO Y CULTIVO DE AIRE Y EN PARAMENTOS C-CAUDAL Y TASAS DE RENOVACION D-INTEGRIDAD DE FILTROS ABSOLUTOS E-PRESION DIFERENCIAL F-TEMPERATURA Y HUMEDAD G-NIVEL SONORO. H-LIMPIEZA Y SANITIZACION DE DUCTOS FILTRO MAL PUESTO, TRASPASO PARTICULAS. 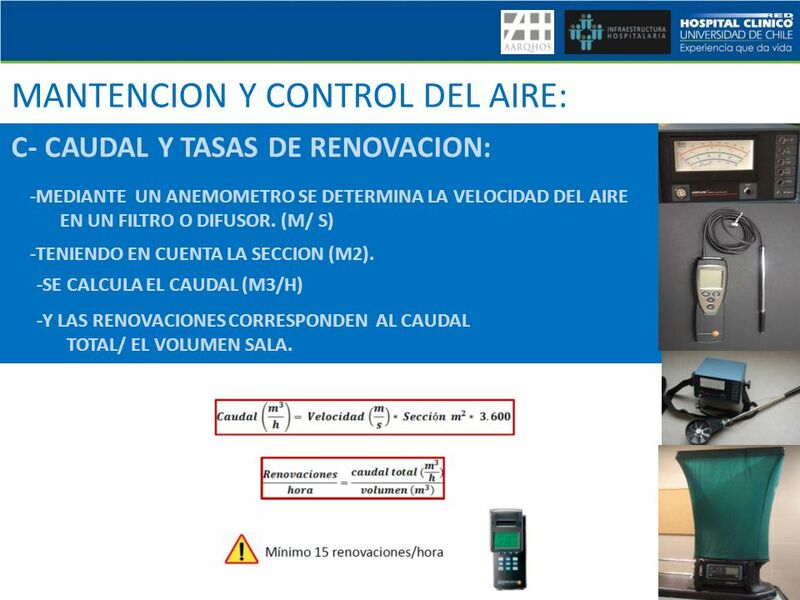 C- CAUDAL Y TASAS DE RENOVACION: -MEDIANTE UN ANEMOMETRO SE DETERMINA LA VELOCIDAD DEL AIRE EN UN FILTRO O DIFUSOR. (M/ S) -TENIENDO EN CUENTA LA SECCION (M2). -SE CALCULA EL CAUDAL (M3/H) -Y LAS RENOVACIONES CORRESPONDEN AL CAUDAL TOTAL/ EL VOLUMEN SALA. E- PRESION DIFERENCIAL: PRUEBA CON MANOMETRO DIFERENCIAL POR DEBAJO DE LAS PUERTAS O CON TRAZADOR DE CORRIENTES DE AIRE. 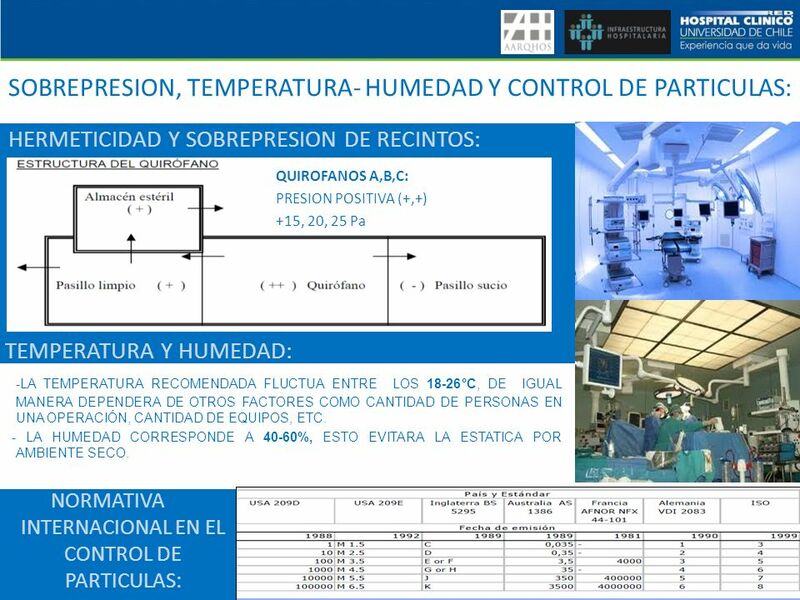 MIDE LA PRESION EN PASCALES (Pa) MANOMETROS DIFERENCIALES F- TEMPERATURA Y HUMEDAD: PRUEBA CON TERMOHIGROMETRO, EN DISTINTOS PUNTOS DE LA SALA, MIDE TEMPERATURA Y HUMEDAD. (20-25°C; %H 45-60%) G- NIVEL SONORO: SONOMETRO PRUEBA CON SONOMETRO, EN DISTINTOS PUNTOS DE LA SALA, MIDE DECIBELES O NIVEL SONORO (UNE :2005, Db). H- SANITIZACION DE DUCTOS: SANITIZACION DE DUCTOS, IDEALMENTE CON EMPRESAS QUE CERTIFIQUEN LA DESINFECCION. 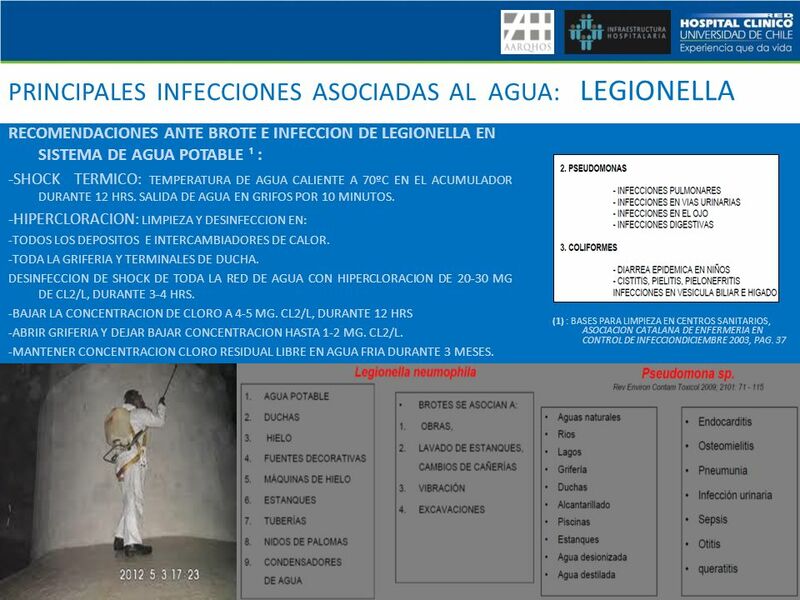 ASEO Y SANITIZACION MEDIANTE LIQUIDOS Y AEROSOLES ESPECIALES, MANTENCION Y PROTOCOLOS DE INFECCION SEGUN RECINTO HOSPITALARIO. 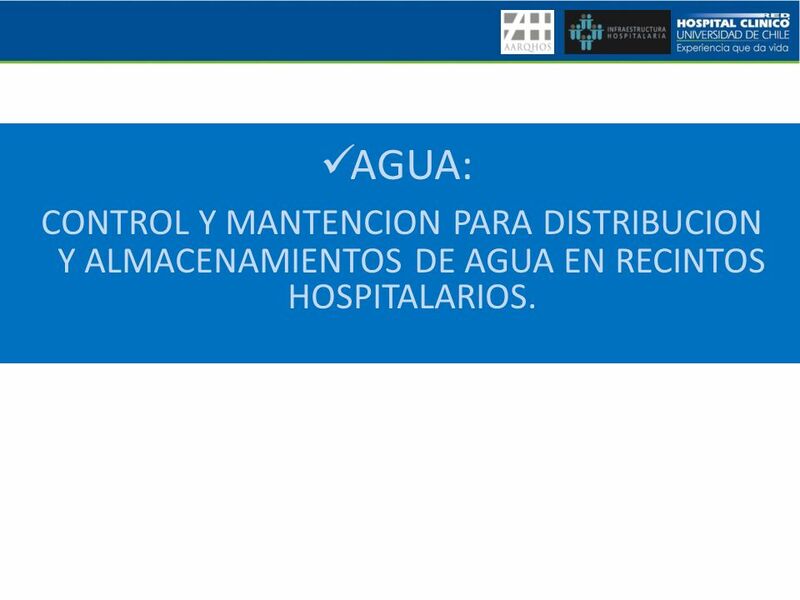 24 AGUA: CONTROL Y MANTENCION PARA DISTRIBUCION Y ALMACENAMIENTOS DE AGUA EN RECINTOS HOSPITALARIOS. 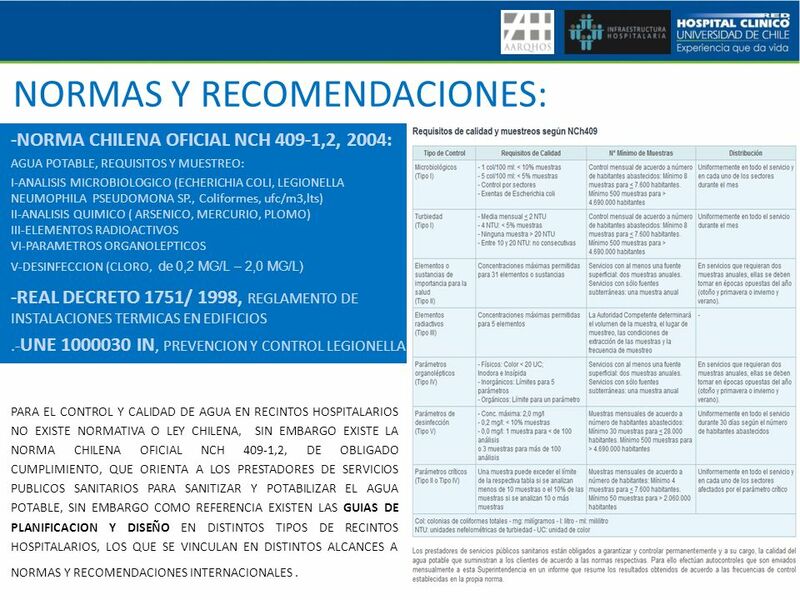 -NORMA CHILENA OFICIAL NCH 409-1,2, 2004: AGUA POTABLE, REQUISITOS Y MUESTREO: I-ANALISIS MICROBIOLOGICO (ECHERICHIA COLI, LEGIONELLA NEUMOPHILA PSEUDOMONA SP., Coliformes, ufc/m3,lts) II-ANALISIS QUIMICO ( ARSENICO, MERCURIO, PLOMO) III-ELEMENTOS RADIOACTIVOS VI-PARAMETROS ORGANOLEPTICOS V-DESINFECCION (CLORO, de 0,2 MG/L – 2,0 MG/L) -REAL DECRETO 1751/ 1998, REGLAMENTO DE INSTALACIONES TERMICAS EN EDIFICIOS .-UNE IN, PREVENCION Y CONTROL LEGIONELLA PARA EL CONTROL Y CALIDAD DE AGUA EN RECINTOS HOSPITALARIOS NO EXISTE NORMATIVA O LEY CHILENA, SIN EMBARGO EXISTE LA NORMA CHILENA OFICIAL NCH 409-1,2, DE OBLIGADO CUMPLIMIENTO, QUE ORIENTA A LOS PRESTADORES DE SERVICIOS PUBLICOS SANITARIOS PARA SANITIZAR Y POTABILIZAR EL AGUA POTABLE, SIN EMBARGO COMO REFERENCIA EXISTEN LAS GUIAS DE PLANIFICACION Y DISEÑO EN DISTINTOS TIPOS DE RECINTOS HOSPITALARIOS, LOS QUE SE VINCULAN EN DISTINTOS ALCANCES A NORMAS Y RECOMENDACIONES INTERNACIONALES . 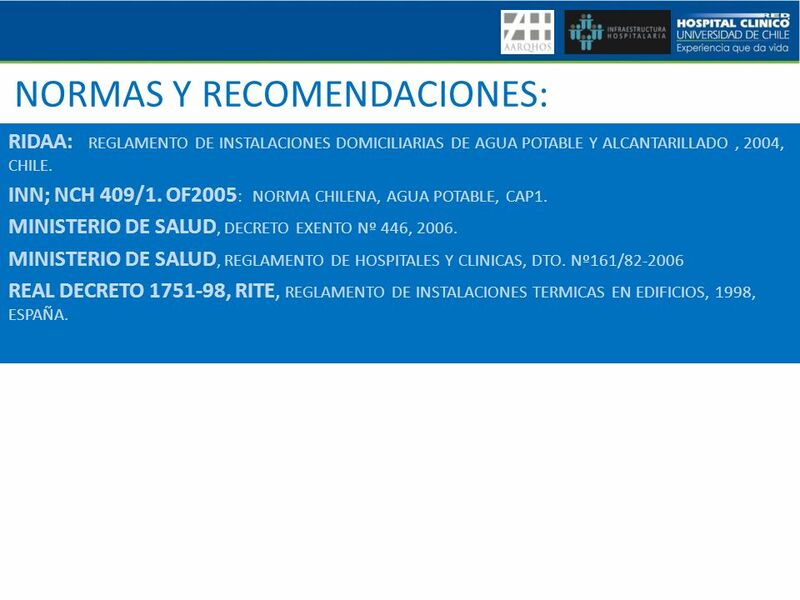 RIDAA: REGLAMENTO DE INSTALACIONES DOMICILIARIAS DE AGUA POTABLE Y ALCANTARILLADO , 2004, CHILE. INN; NCH 409/1. OF2005: NORMA CHILENA, AGUA POTABLE, CAP1. MINISTERIO DE SALUD, DECRETO EXENTO Nº 446, 2006. 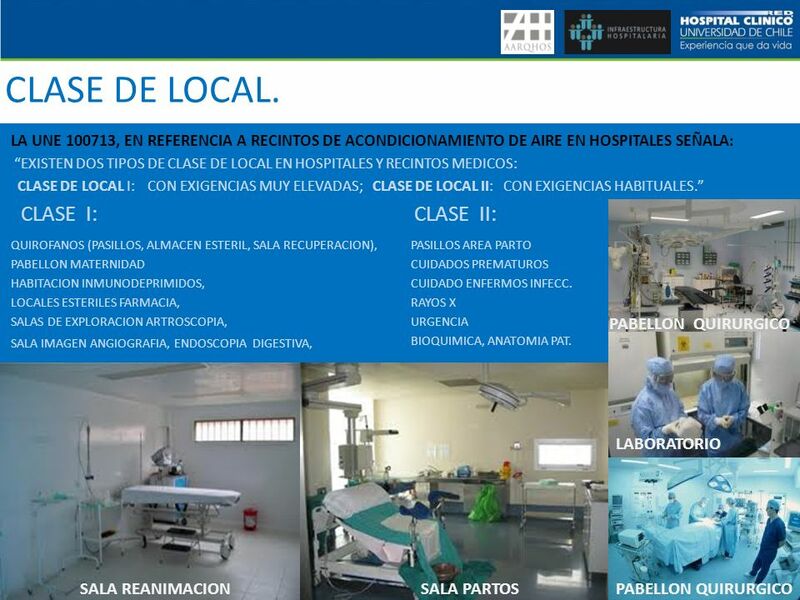 MINISTERIO DE SALUD, REGLAMENTO DE HOSPITALES Y CLINICAS, DTO. 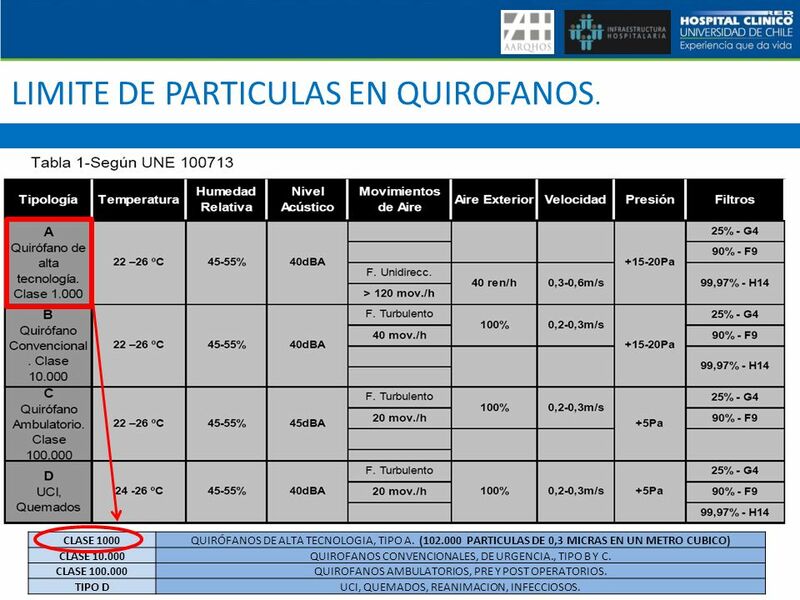 Nº161/ REAL DECRETO , RITE, REGLAMENTO DE INSTALACIONES TERMICAS EN EDIFICIOS, 1998, ESPAÑA. 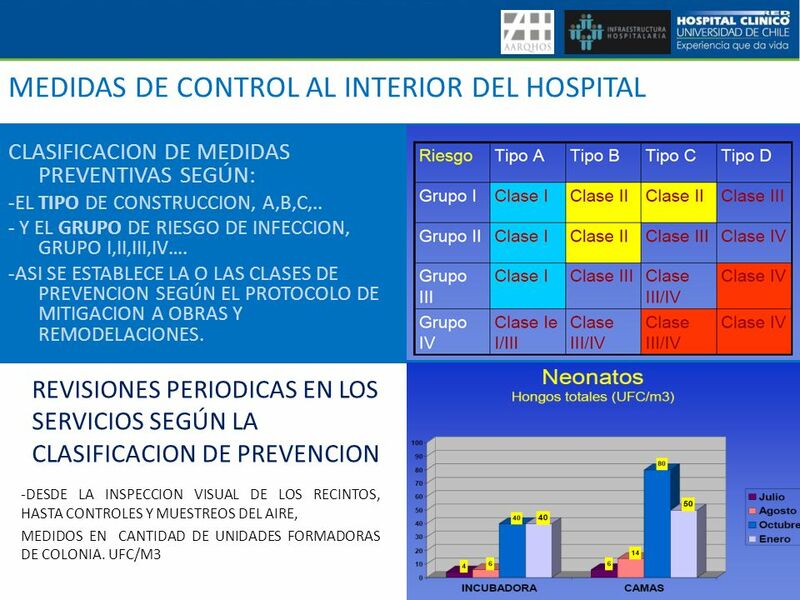 MITIGACION DE INFECCIONES AL INTERIOR DEL HOSPITAL. 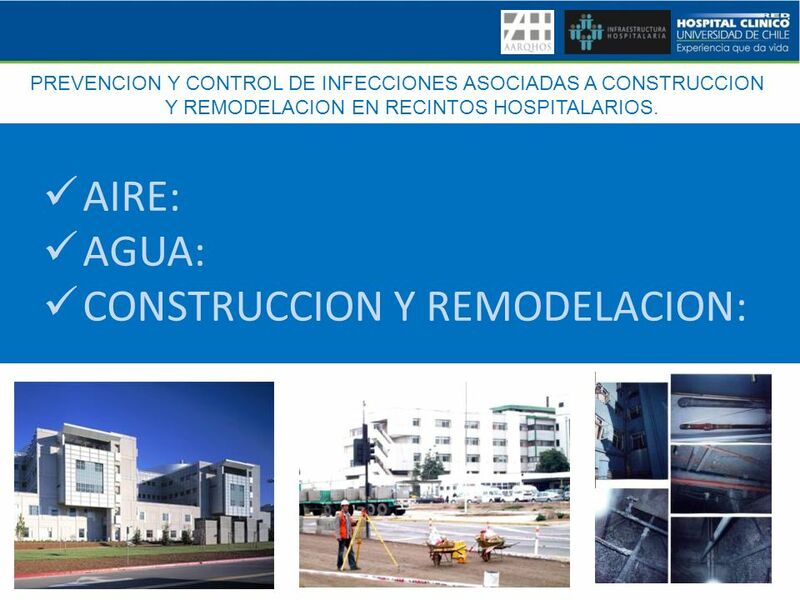 -TABIQUE ESTANCO: TABIQUE SELLADO HERMETICAMENTE PARA RECINTOS REMODELADOS AL INTERIOR DEL HOSPITAL, IMPIDE LA CONTAMINACION DIRECTA DEL AIRE, ESTA CONSTRUIDO CON MATERIALES EPOXICOS Y LAVABLES; SELLADO EN CIELO, PISO Y MUROS. 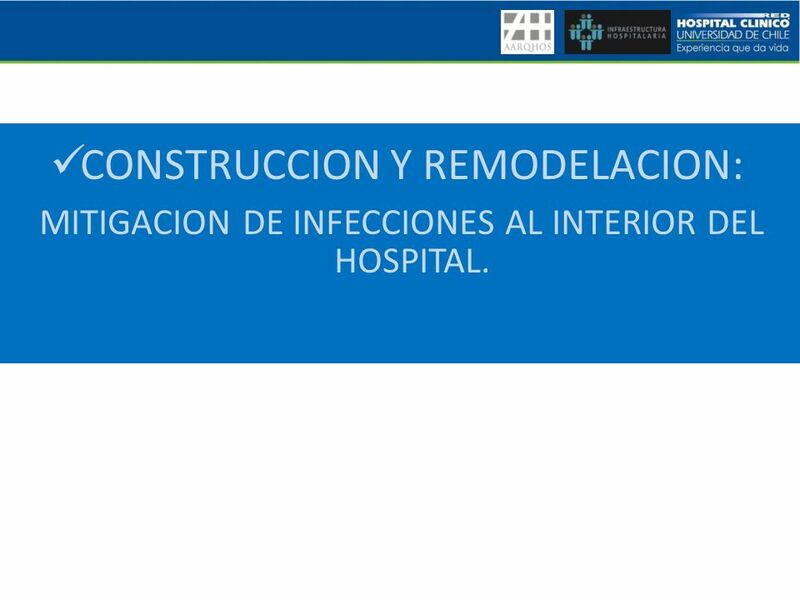 -ESCLUSA DE EXTRACCION: ESCLUSA DE EXTRACCION DE AIRE PROVISORIA, PARA EL TRANSITO ENTRE LA CONSTRUCCION Y EL HOSPITAL, PERMITE EL FLUJO Y TRASPASO DE MATERIALES Y RETIRO DE ESCOMBROS, IDEALMENTE CON UNA SUPERFICIE QUE PERMITA EVITAR LA ABERTURA SIMULTANEA DE ENTRADA Y SALIDA DEL TRANSITO, DISTANCIA MINIMA RECOMENDABLE 2,5 M. ENTRE ACCESO Y SALIDA. 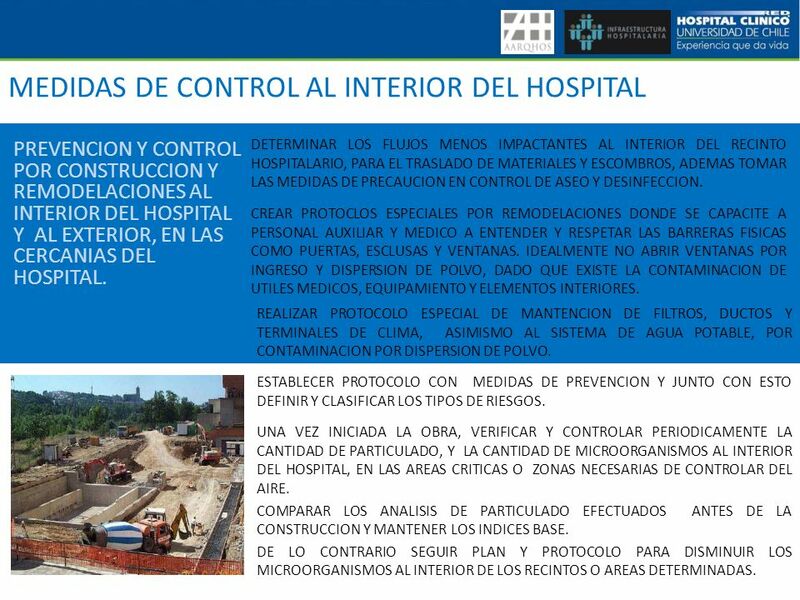 PREVENCION Y CONTROL POR CONSTRUCCION Y REMODELACIONES AL INTERIOR DEL HOSPITAL Y AL EXTERIOR, EN LAS CERCANIAS DEL HOSPITAL. 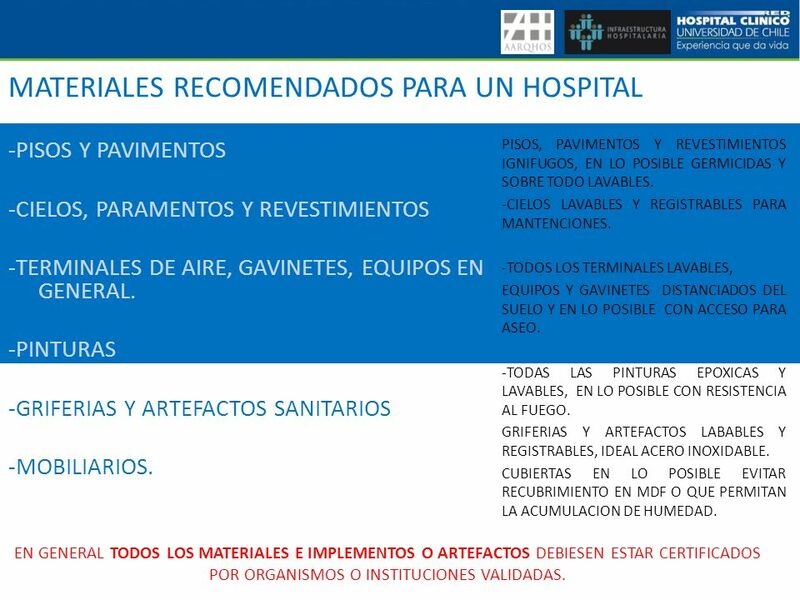 DETERMINAR LOS FLUJOS MENOS IMPACTANTES AL INTERIOR DEL RECINTO HOSPITALARIO, PARA EL TRASLADO DE MATERIALES Y ESCOMBROS, ADEMAS TOMAR LAS MEDIDAS DE PRECAUCION EN CONTROL DE ASEO Y DESINFECCION. 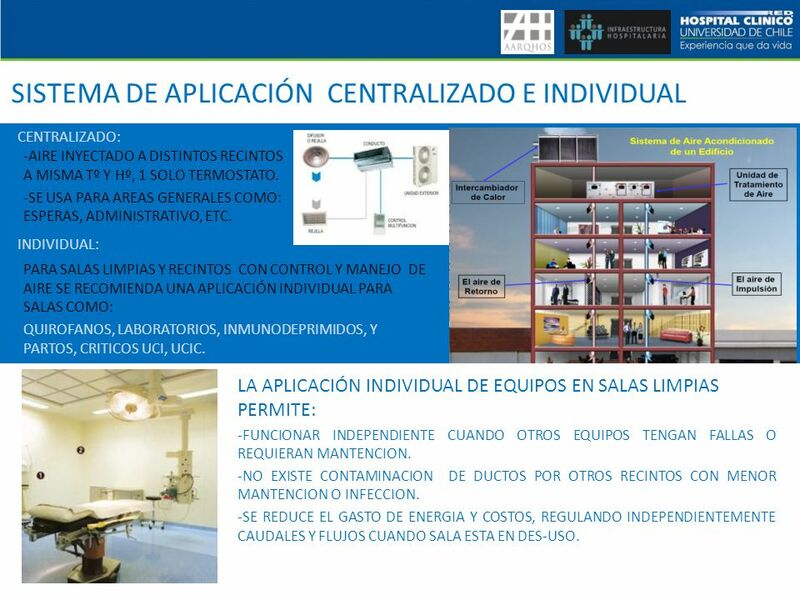 CREAR PROTOCLOS ESPECIALES POR REMODELACIONES DONDE SE CAPACITE A PERSONAL AUXILIAR Y MEDICO A ENTENDER Y RESPETAR LAS BARRERAS FISICAS COMO PUERTAS, ESCLUSAS Y VENTANAS. 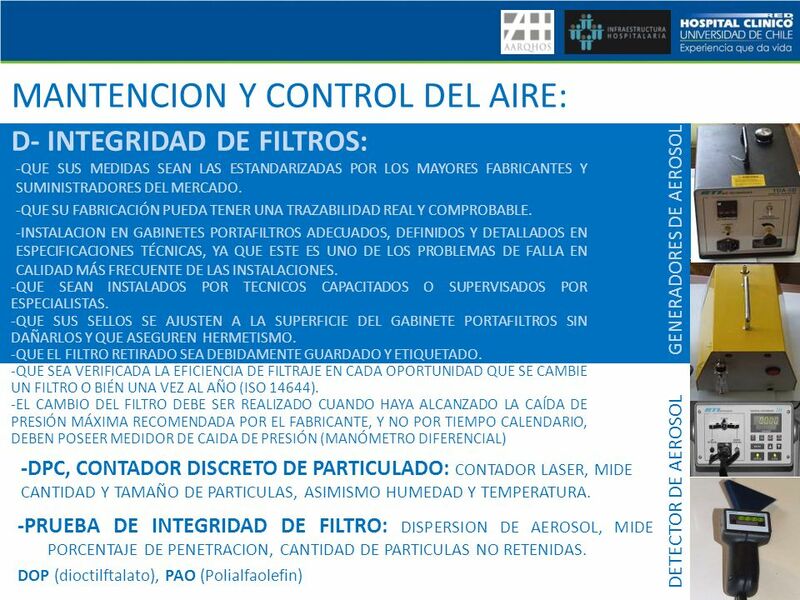 IDEALMENTE NO ABRIR VENTANAS POR INGRESO Y DISPERSION DE POLVO, DADO QUE EXISTE LA CONTAMINACION DE UTILES MEDICOS, EQUIPAMIENTO Y ELEMENTOS INTERIORES. 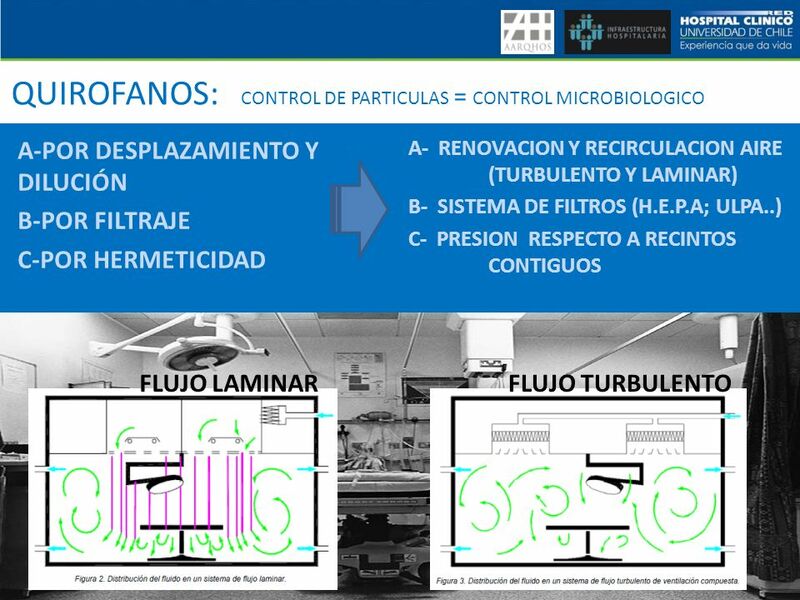 REALIZAR PROTOCOLO ESPECIAL DE MANTENCION DE FILTROS, DUCTOS Y TERMINALES DE CLIMA, ASIMISMO AL SISTEMA DE AGUA POTABLE, POR CONTAMINACION POR DISPERSION DE POLVO. ESTABLECER PROTOCOLO CON MEDIDAS DE PREVENCION Y JUNTO CON ESTO DEFINIR Y CLASIFICAR LOS TIPOS DE RIESGOS. 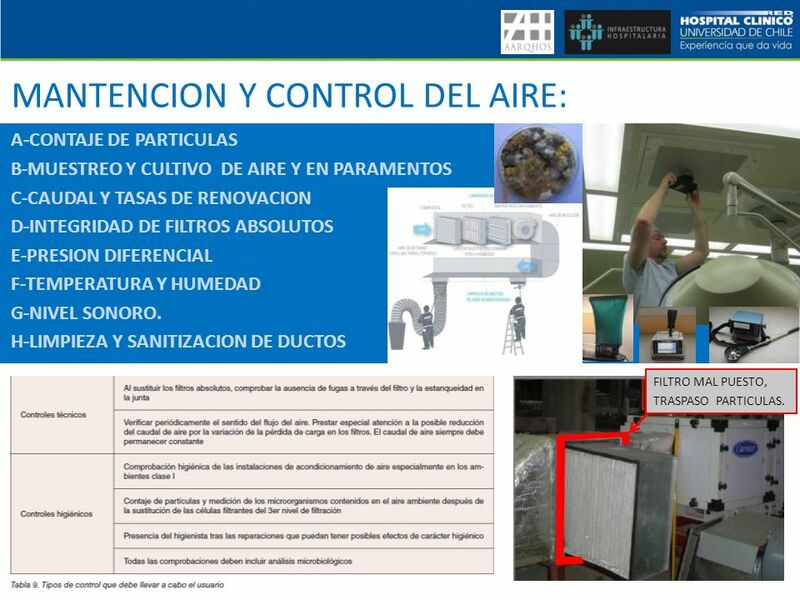 UNA VEZ INICIADA LA OBRA, VERIFICAR Y CONTROLAR PERIODICAMENTE LA CANTIDAD DE PARTICULADO, Y LA CANTIDAD DE MICROORGANISMOS AL INTERIOR DEL HOSPITAL, EN LAS AREAS CRITICAS O ZONAS NECESARIAS DE CONTROLAR DEL AIRE. COMPARAR LOS ANALISIS DE PARTICULADO EFECTUADOS ANTES DE LA CONSTRUCCION Y MANTENER LOS INDICES BASE. DE LO CONTRARIO SEGUIR PLAN Y PROTOCOLO PARA DISMINUIR LOS MICROORGANISMOS AL INTERIOR DE LOS RECINTOS O AREAS DETERMINADAS. 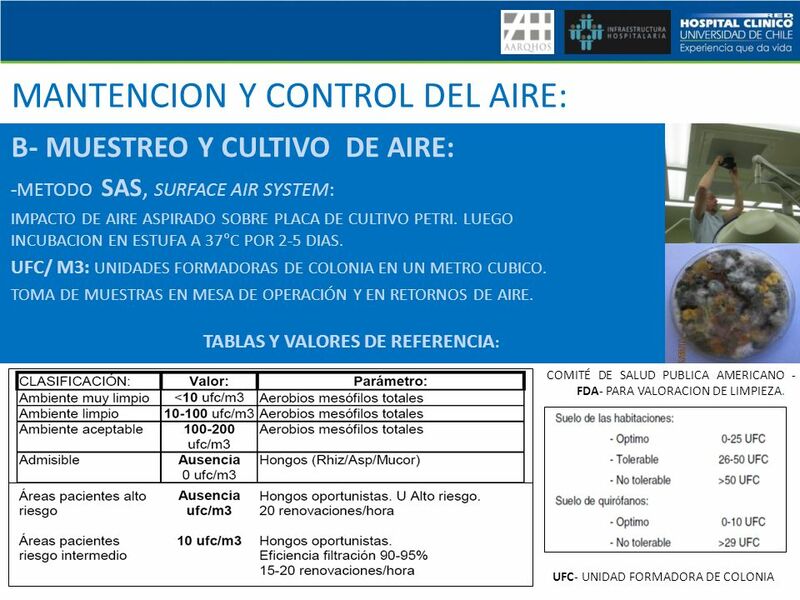 -PISOS Y PAVIMENTOS -CIELOS, PARAMENTOS Y REVESTIMIENTOS -TERMINALES DE AIRE, GAVINETES, EQUIPOS EN GENERAL. -PINTURAS -GRIFERIAS Y ARTEFACTOS SANITARIOS -MOBILIARIOS. PISOS, PAVIMENTOS Y REVESTIMIENTOS IGNIFUGOS, EN LO POSIBLE GERMICIDAS Y SOBRE TODO LAVABLES. -CIELOS LAVABLES Y REGISTRABLES PARA MANTENCIONES. -TODOS LOS TERMINALES LAVABLES, EQUIPOS Y GAVINETES DISTANCIADOS DEL SUELO Y EN LO POSIBLE CON ACCESO PARA ASEO. -TODAS LAS PINTURAS EPOXICAS Y LAVABLES, EN LO POSIBLE CON RESISTENCIA AL FUEGO. GRIFERIAS Y ARTEFACTOS LABABLES Y REGISTRABLES, IDEAL ACERO INOXIDABLE. 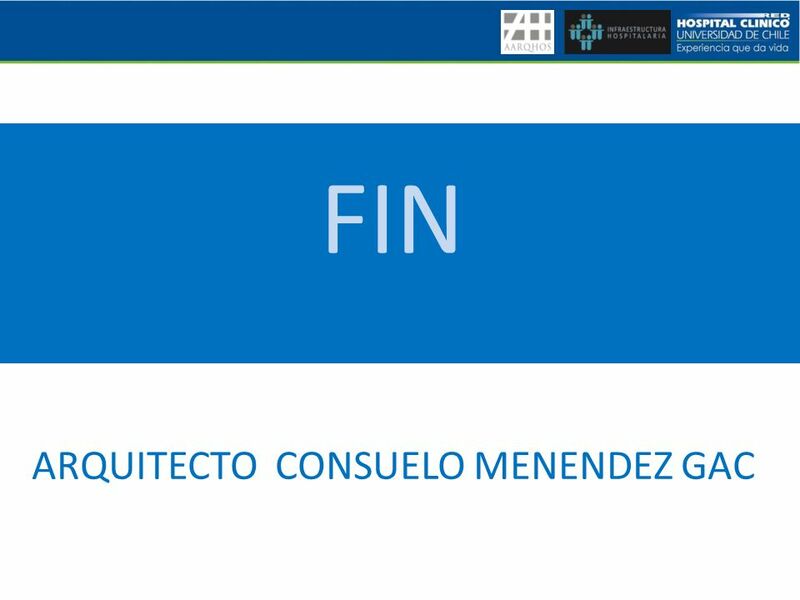 CUBIERTAS EN LO POSIBLE EVITAR RECUBRIMIENTO EN MDF O QUE PERMITAN LA ACUMULACION DE HUMEDAD. EN GENERAL TODOS LOS MATERIALES E IMPLEMENTOS O ARTEFACTOS DEBIESEN ESTAR CERTIFICADOS POR ORGANISMOS O INSTITUCIONES VALIDADAS. 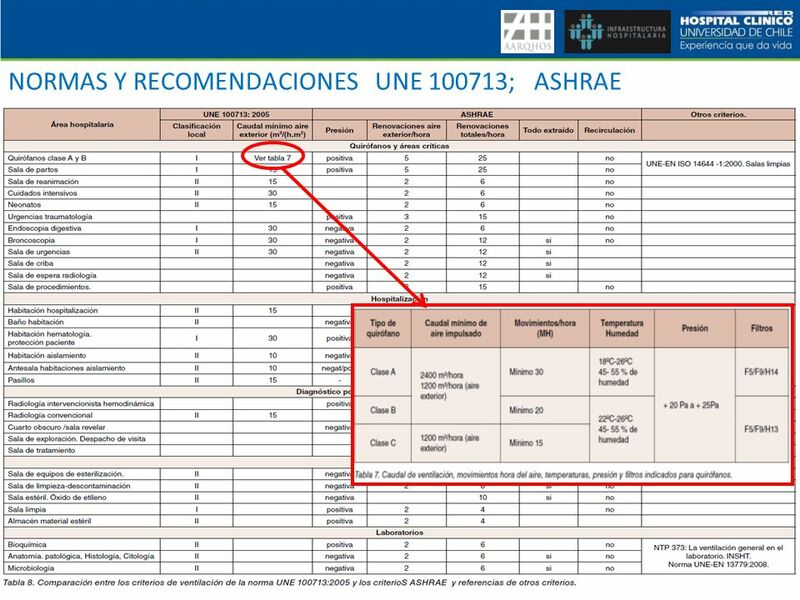 36 BIBLIOGRAFIA AIRE: ASHRAE: AMERICAN SOCIETY OF HEATING, REFRIGERATION AND AIR-CONDITIONING ENGINEERS, 2007, Handbook-HVAC Application, table 3. A.I.A. 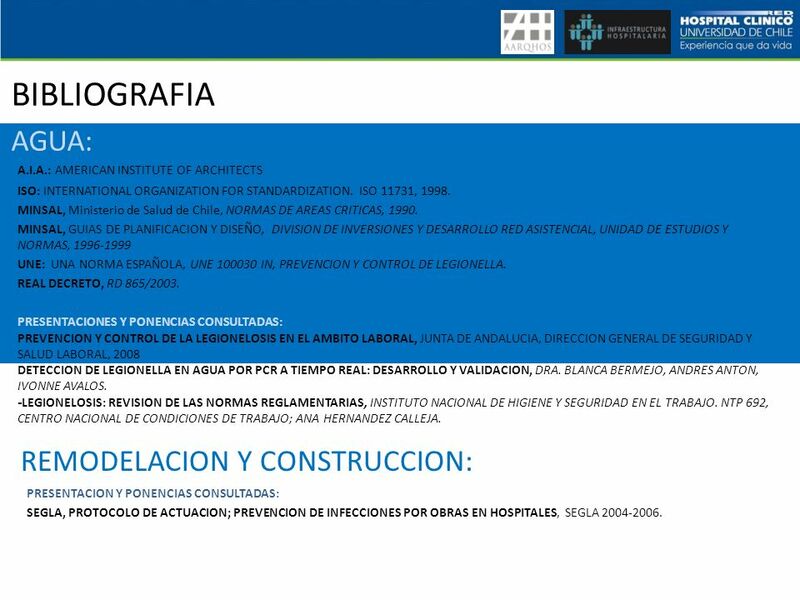 : AMERICAN INSTITUTE OF ARCHITECTS FS: FEDERAL ESTÁNDAR U.S, FS 209E ISO: INTERNATIONAL ORGANIZATION FOR STANDARDIZATION, , , ISO MINSAL, Ministerio de Salud de Chile, NORMAS DE AREAS CRITICAS, 1990. 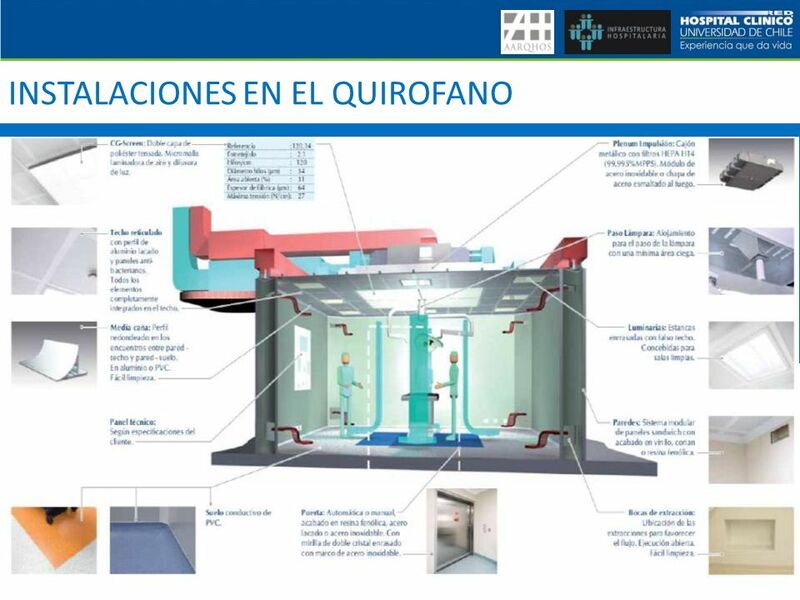 MINSAL, GUIAS DE PLANIFICACION Y DISEÑO, DIVISION DE INVERSIONES Y DESARROLLO RED ASISTENCIAL, UNIDAD DE ESTUDIOS Y NORMAS, UNE: UNA NORMA ESPAÑOLA, UNE :2005, Instalaciones de Acondicionamiento de aire en hospitales. 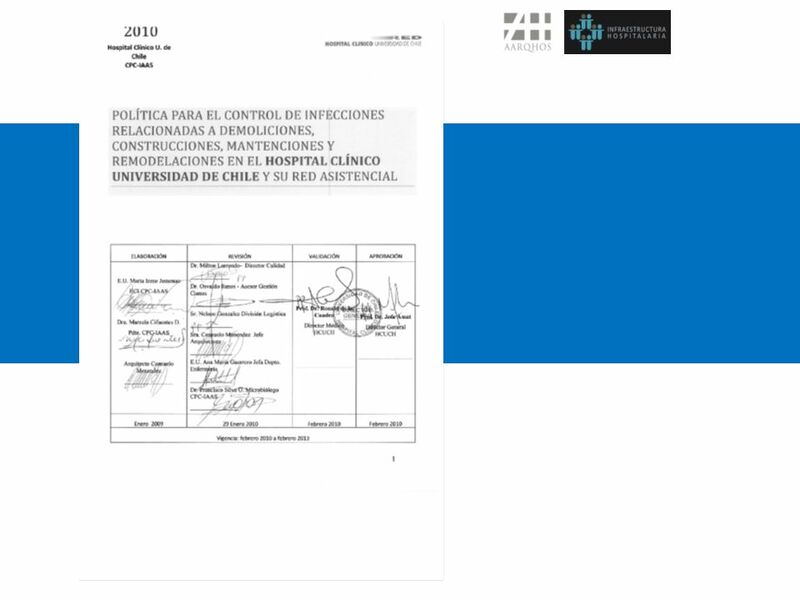 PRESENTACIONES Y PONENCIAS CONSULTADAS: -AMBIENTES PROTEGIDOS EN PACIENTES INMUNODEPRIMIDOS, Dra. Mª Cristina Ajenjo H., Departamento de Medicina Interna y Programa de Infectología. Facultad de Medicina. P. Universidad Católica de Chile. 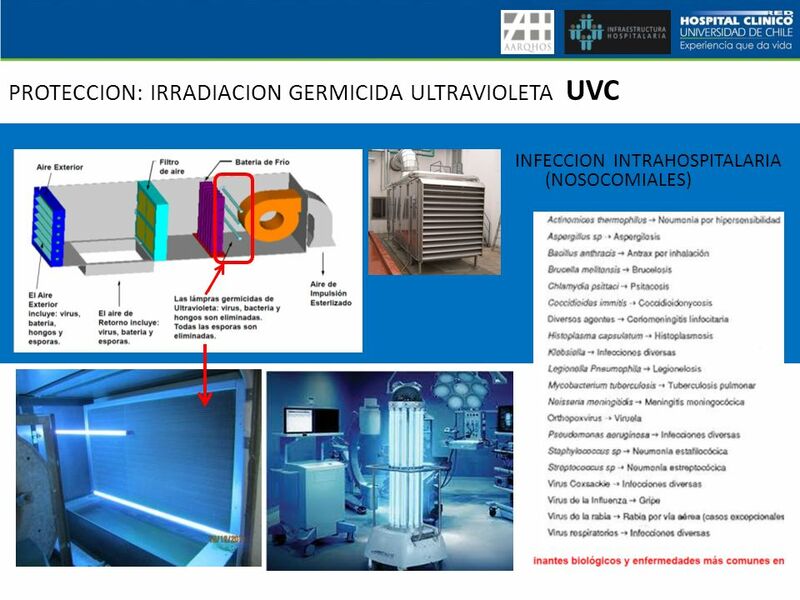 -BIOSEGURIDAD AMBIENTAL EN HOSPITALES, Noelia Bailera Palomero, Asesora técnica, SIK. -CLASIFICACION DE LAS SALAS BLANCAS, GEI-2ª: GRUPO EUROPEO DE INGENIERIA AGROALIMENTARIA Y AMBIENTAL. 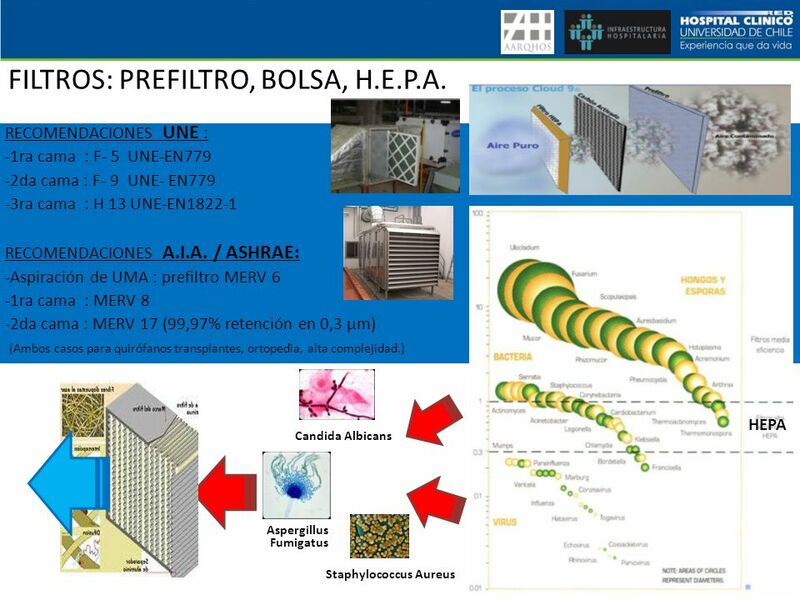 -SISTEMAS DE CLIMATIZACION, FILTRAJE DE AIRE EN RECINTOS ESPECIALES, 3º congreso de infraestructura hospitalaria, agosto 2009, RCA ltd., Ruben Cespedes A., Especialista en Sistemas de Aire filtrado. 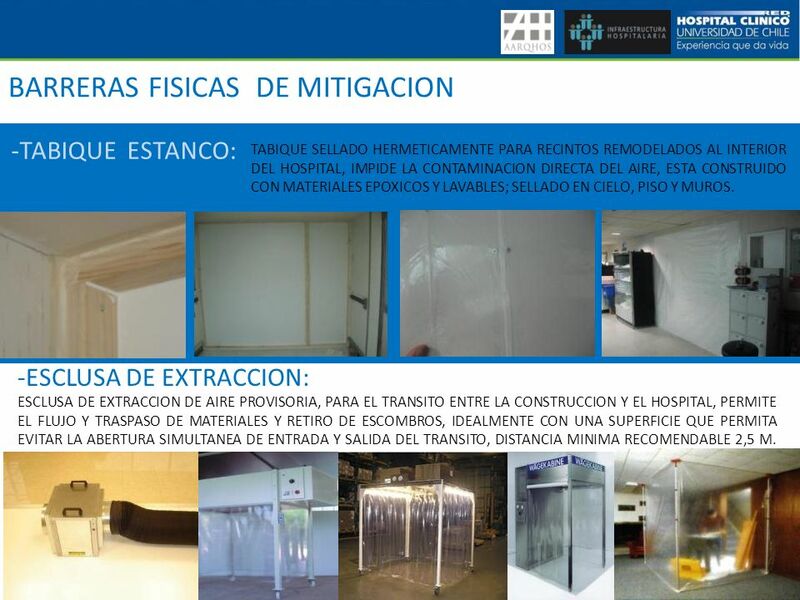 -VENTILACION GENERAL EN HOSPITALES, Instituto Nacional de Higiene y Seguridad en el trabajo. NTP 859, CENTRO NACIONAL DE CONDICIONES DE TRABAJO; HOSPITAL SANT PAU. BARCELONA. -ZONAS CONTROLADAS EN HOSPITALES, ROSA Pi., 20 Noviembre 2008. 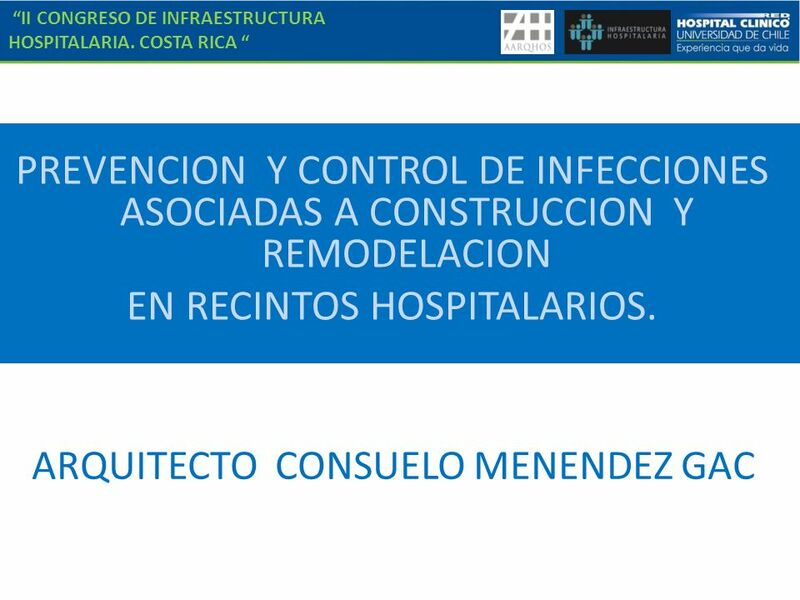 Descargar ppt "“II CONGRESO DE INFRAESTRUCTURA HOSPITALARIA. COSTA RICA “"
COMITÉ TECNICO DE NORMALIZACIÓN DE CALIDAD AMBIENTAL EN INTERIORES José Luis TEJERA OLIVER Director Desarrollo Estratégico y Corporativo 1er CONGRESO INTERNACIONAL. Gestión de la seguridad y salud en el trabajo en establecimientos de salud CLINICA RICARDO PALMA Dr. Jaime Moya Grande Gerente de Salud. CASETA METEOROLÓGICA I.E.S Francisco de Goya.